There’s a clear parallel between the behaviour of the fossil fuel giants and tobacco companies: tobacco companies went to extraordinary lengths to suppress the knowledge that smoking caused cancer, activities that eventually resulted in multi-billion dollar settlements. Today, some fossil fuel giants engage in similar tactics to deny climate change, paying some of the same think tanks, lobbyists and even scientists who aided cigarette companies to distort the truth about climate change. They have access to the same research the rest of us do, but they systematically deny it, or worse, hire their own “scientists” to manufacture trumped up evidence of their own. But now groundbreaking, independent new research — eight years in the making — is turning this all around, shining fresh light on the biggest climate culprits in the world, and quantifying exactly how much of the climate change pie belongs to whom. So what does this mean? For the first time in history, we can identify who has made the biggest overall contributions to greenhouse gas emissions. Chevron, ExxonMobil, Shell, BP and ConocoPhilips are responsible for an estimated 12.5 per cent of cumulative world emissions of industrial CO2 and methane. Using the best available data, we can now estimate the cumulative carbon pollution each producer has contributed to date, and name names. And that should make a lot of big polluters very nervous, and a lot of activists, scholars and journalists very excited. Activists and journalists like the Arctic 30, for example — 28 climate heroes and two freelance journalists, who are facing years behind bars in Russia for standing up to Gazprom, one of the biggest climate culprits in the game, and number five in the ranking of the analyzed companies. So how did this research come to be? A diligent independent researcher, Richard Heede, has toiled at this question for many years. His findings on the cumulative carbon emissions for 90 carbon producers were peer reviewed this year and are now published in the journal Climatic Change. You will notice in my careful choice of words, how meaningful and groundbreaking this research is. This work has been Rick Heede’s quiet passion for well over a decade. Now his research has been published and points the finger at a few dozen companies at the start of the supply chain responsible for a huge share of estimated global greenhouse gas emissions. These are the corporations who have profited enormously while fueling our carbon addiction. 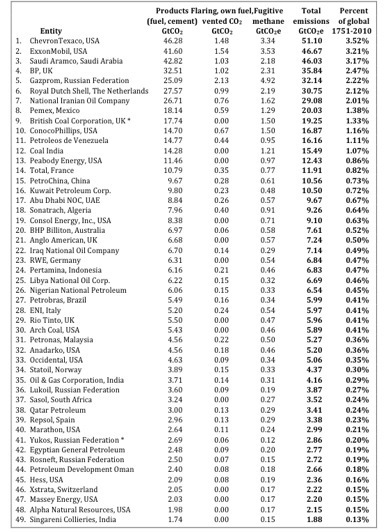 Think for a moment about the patience it would take a researcher to look back at the history of fossil fuel extraction, back to the 1800s for coal, and 1900s for oil and dig up credible data, year by year, detailing the amount of each fuel extracted for market by each entity, including investor-owned companies. You’d have to account for mergers and acquisitions big and small over time. Then you would add up each of these company histories, correcting for double counting, into a giant layered spreadsheet and start to get a picture of the key actors and their legacy — the cumulative emissions of carbon that they are ultimately responsible for, even if the actual emissions happen elsewhere, through the millions upon millions of point sources. So who are the real culprits here? Peaceful climate protesters like the Arctic 30 or reckless fossil fuel companies, the drivers of climate change, who put our lives at risk and destroy our natural systems? It’s incredibly complex and time-consuming work. But the complexity of the methodology and work that went into this study is balanced by the clarity of the findings: In total, 90 carbon producers were analyzed, and Heede was able to account for emissions equivalent to 63 per cent of the total CO2 emissions from fossil fuels dating back to 1854. This arduous work is impressive and provides data, that the coal and oil companies would rather like to keep out of the public domain! But we know, and they know, that their plans to extract and burn more and more carbon will continue to do irreparable damage to life on our planet. Starting with Greenpeace’s 1997 Carbon Logic or Bill McKibben’s Do the Math which draws from the amazing Carbon Tracker Carbon Bubble research, and adding the 2013 Greenpeace/Ecofys ‘Point of no return’ report, we can paint a pretty clear picture of past and future legacy of the carbon club. 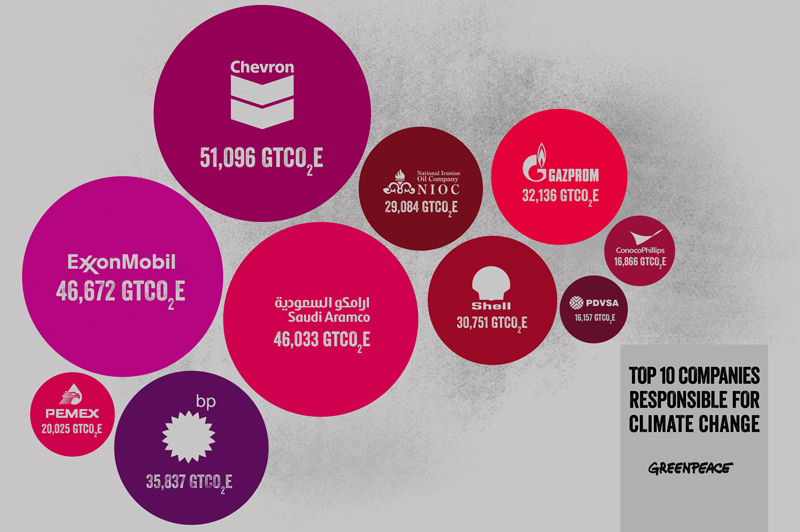 We can see that these companies’ future plans to exploit their oil and coal ‘reserves’ simply cannot be allowed to happen if we are to avoid dangerous climate chaos. So who are the real culprits here? Peaceful climate protesters like the Arctic 30 or reckless fossil fuel companies, the drivers of climate change, who put our lives at risk and destroy our natural systems? With the glaring light of this new research shining into even the darkest corners of Big Oil everywhere, that answer has become even clearer. I believe that this groundbreaking research will shake up the energy sector. The use of this data by other scientists, academics, analysts, insurers, lawyers, regulators, and activists will have a snowball effect and will lead to the next step in the fight against climate change: make the culprits liable for the harm they have caused. Heede´s analysis starts in 1854, the year for which the earliest production data are available (for Westmoreland Coal). He then compared his results to data from the US Department of Energy´s (DOE) Carbon Dioxide Information Analysis Center (CDIAC) database for fossil fuel CO2, flaring, and cement production which dates back to as early as 1751 (in the case of coal). Kumi Naidoo is the executive director of Greenpeace International. Follow Kumi Naidoo on Twitter: www.twitter.com/kuminaidoo This post originally appeared here.